Click the ‘Add Beam’ button on the left to bring up a pop up asking you for the length of your beam. Enter the length, and click ‘Add It’. Click the ‘Add/Edit Section’ button on the right to bring up a pop up asking how you’d like to specify your section. There are two options, either use the Section Builder to graphically dimension your section, or simply input the values for Young’s Modulus (E) and Moment of Inertia (Iz). The next section will cover how to use the Section Builder in detail. For this example, simply input the values as shown in the screenshot. Note that the form fields support scientific notation. Click ‘Submit’ when finished. 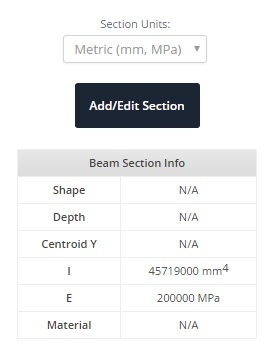 Note that the table to the right will become populated with the beam section information. The fields for ‘Shape’, ‘Depth’, ‘Centroid Y’, and ‘Material’ show ‘N/A’ because the Section Builder was not used. For the support location, this is asking for the distance from the left where you want to apply the support. You can use the horizontal X axis as your guide. In this example, apply a ‘Fixed Support’ at the leftmost side of the beam (i.e. at 0 metres). Click ‘Add It’ when finished. Repeat this for a ‘Pin Support’ in the middle of the beam (i.e at 2.5 metres from the left). The supports will be added to the screen as shown below. Click the ‘Add Point Load’ button on the left to bring up a pop up asking you to select a direction, location, and magnitude for your point load. In this example, apply a 10 kN point load, pointing down, at 1.25 metres from the left of the beam. Note that magnitudes need to be positive values. The direction arrows will allow you to specify the appropriate direction (down, up, or angled). Click ‘Add It’ when finished. The point load will be added to the screen as shown below. Click the ‘Add Moment’ button on the left to bring up a pop up asking you to select a direction, location, and magnitude (similar to specifiying a point load). In this example, apply a 5 kN.m moment at 3.75 m along the beam, in a counter-clockwise direction. Again, note that values must be entered as positives. Click ‘Add It’ when finished. The moment will be added to the screen as shown below. Click the ‘Add Distributed Load’ button on the left to bring up a pop up asking you to select the location and magnitude of the start and ending values. For this example, specify a non-uniform distributed load between 2 m and 3 m, with values of 5 kN/m and 10 kN/m respectively. Click ‘Add It’ when finished. The non-uniform distributed load will be added to the screen as shown below. A uniform distributed load (UDL) could have been specified by entering in equal magnitudes. Click the ‘Add Hinge’ button on the left to bring up a pop up asking you to specify the location of the hinge. Note that hinges cannot be specifed at the end points of the beam or at the location of supports. For this example, specify the hinge at 0.625 m from the left. Click ‘Add It’ when finished. The hinge will be added to the screen as shown below. Edits to any of the inputs can be made in the table below the model. Simply click the pencil icon to edit the input, or click the cross icon to delete it.